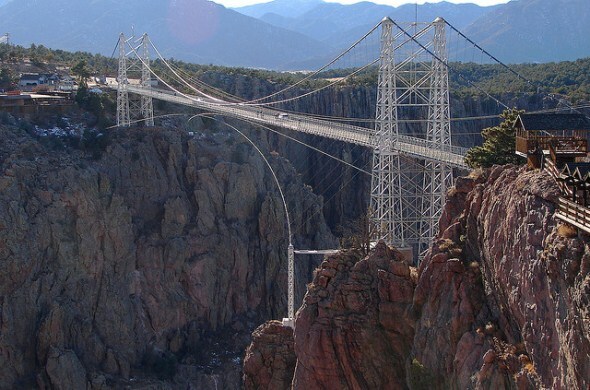 The Royal Gorge Bridge is one of the world’s highest suspension bridges, crossing a narrow gorge 1,053 feet above the Arkansas River. The popular Colorado landmark, built in 1929 for $350,000, celebrated its reopening in 2015, two years after a wildfire damaged the bridge and destroyed many of the buildings in the park that surrounds it, as well as its antique carousel and aerial tram. The Royal Gorge Fire near Cañon City burned more than 3,200 acres, jumping across the Arkansas at the Royal Gorge Bridge and Park on June 11, 2013. Park owners have rebuilt and restored, as well as adding to the features that visitors enjoy. “Fortunately the Bridge itself escaped with only minor damage to some of its wooden planks,” they say. Visitors can walk or drive across the bridge, which is 1,260 feet long but just 18 feet wide. The bridge has 1,292 planks of deck and is supported by cables containing 2,100 strands of No. 9 galvanized wire. It was built to support more than 2 million pounds. Attractions at the park include a new visitor center, aerial gondolas that travel more than 1,200 feet above the Arkansas River, and the Cloudscraper, said to be the highest zipline in North America. Also in the park are a miniature train, children’s play land, and the Plaza Theater that includes a display about the history of the bridge, built in 1929.